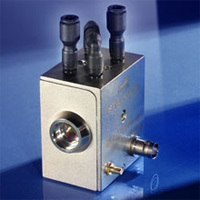 Acousto-optic Q-Switches are special Modulators designed for use inside laser cavities. They have exceptionally low insertion loss and are able to withstand very high laser powers. In normal use an RF signal is applied to the Q-Switch causing it to deflect a proportion of the laser beam. This increases the cavity losses and prevents lasing. When the RF signal is switched off, the cavity losses decrease rapidly and an intense laser pulse evolves. 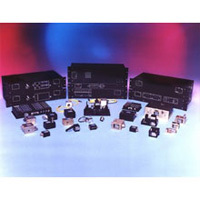 Gooch & Housego manufactures Q-Switches for use in infra-red, lamp-pumped and diode-pumped solid state lasers, and specialise in developing custom-made solutions. When choosing a Q-Switch, key parameters to consider are wavelength, optical power density, polarization, beam diameter, loss modulation, size constraints/mechanical configuration and cooling possibilities. 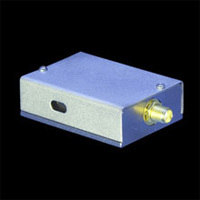 An AO Modulator is a device that modulates and controls the intensity of an optical beam. For highest speeds the laser beam will be focused down, forming a beam waist as it passes through the Modulator. The main factors that dictate the design, and therefore choice of device, are the operating wavelength and the speed. The wavelength and optical power will heavily influence the choice of interaction medium, and the speed will determine the minimum drive frequency, and thus the acoustic transducer design. Gooch & Housego manufactures an extensive range of AO Modulators from a variety of materials covering UV to mid IR for scientific, industrial & biomedical applications. Many of these products are also available Fibre-Coupled and we also offer a comprehensive range of purpose designed RF drivers. We take pride in developing custom-made solutions and ensure that all areas of critial production are carried out in-house, from material selection to fina assembly and test. A Pockels cell alters the polarization state of light passing through it when an applied voltage induces birefringence changes in an electro-optic crystal such as KD*P and BBO. 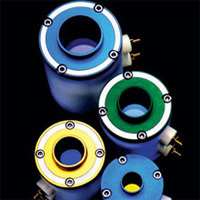 When used in conjunction with polarizers, these cells can function as optical switches, or laser Q-switches. 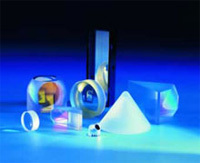 Frequently, Q-switches are employed in laser cavities for the purpose of shortening the output pulse, resulting in a light beam with enhanced peak intensity. In order to provide the device best suited to your purpose, Gooch and Housego offers the industry standard QX series, economical IMPACT cells, BBO-based LightGate, and large-aperture TX Pockels cell lines. High-speed electronic drivers properly matched to the cell produce the best results for short pulse applications. Glass and crystal processing has been a core business of G&H since 1948. Experience in manufacturing precision optical components has enabled G&H to become the worlds leading manufacturer of AO Q-switches. G&H can apply precision and optical expertise to the manufacture of components in a wide variety of optical materials, offering precision optical finishes with extremely high accuracy and tolerances on engineered parts. As well as precision drilling, shaping, polishing, and honing of optical materials, G&H have an in-house coating capability, providing high quality AR, HR, broadband and narrowband coatings. Our comprehensive knowledge of both optical and mechanical properties of optical materials combined with the ability to handle all aspects of component manufacture on one site ensures the highest quality product, from a lens to a complex, multi-faceted CNC machined glass part. Gooch & Housego has been supplying high quality fibre optic components and optical modules into a variety of market sectors 1985. 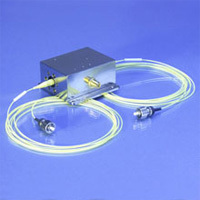 The core technology used for our ‘passive’ components is fused biconical tapering and the current product portfolio includes tap couplers, wavelength combiners/splitters, polarization maintaining couplers, monolithic 1x3s and 1x4s, as well as a multimode power combiners used in high power fibre lasers. We also specialise in the custom packaging of semiconductor devices for a variety of applications and our clean room facility includes equipment for die attach, wire bonding as well as hermetic sealing and testing (fine and gross leak). G&H’s custom modules are assemblies of passive and/or active optical components designed to provide added functionality. An in-depth understanding of optical component performance, combined with the use of low loss G&H components, ensures the highest possible specifications. Our module design and manufacture capability enable you to stay focused on your core competence, whilst reducing time to market and development costs. The Listings to the side will direct you to the driver needed for your application.